We all have brands we love because they deliver on their promise and their promise relieves us of some pain, anxiety, or frustration. 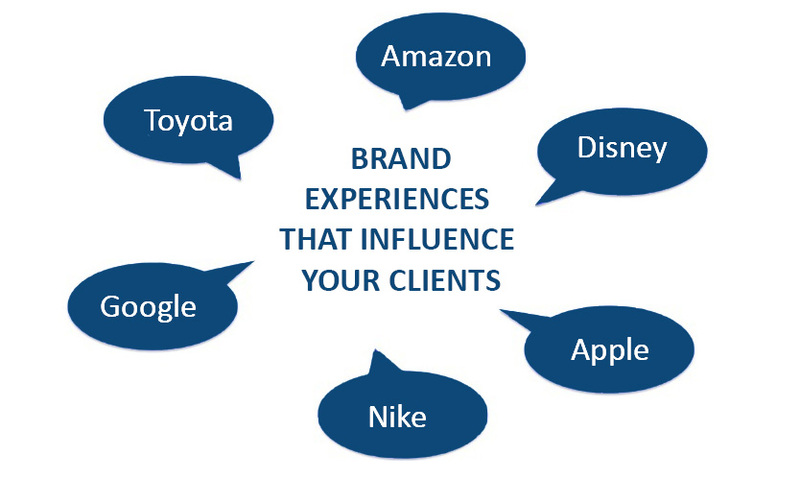 In this post, I looked at some brands Client Savvy team members love to see if I can connect the dots between the customer experience (CX) those brands deliver and the world of professional services. Can your firm deliver a B2C-type experience to your clients? Yes. Eleanor’s vote went to Staples. According to Eleanor, even though it is easy to order office supplies online, sometimes you want to see what you are buying in person. Her experience with her local Staples store brings home the value of a good team. Eleanor’s experience: I needed to replace the headset for my computer. I went to the nearest Office Supply store, walked in the door and asked where I might find headsets. The person pointed me in the general direction and left me to my own devices (pun intended). Unable to speak with someone familiar with the merchandise, I left the store. And headed further away to the Staples. I walked in the door, was greeted warmly and asked what they might help me find. When I said headsets, the staff member told me which aisle and called for another staff member to meet me there. I selected the item I wished to try, paid for it and left the store. Once I unpacked the headset at home and put it on, it was clear that this headset would not do. The next evening, I returned to Staples and told the cashier I wanted to make an even exchange. Once again, they called a staff member to meet me at the headsets. They listened, and we problem-solved. Having a better idea of what would meet my needs, they made a recommendation and it worked perfectly. The best part? I met 6 people in those two days. I know if I go back again, number 7 will be just as ready to help. James’ vote went to Instacart. For those not familiar with Instacart, this company offers same-day grocery delivery service. What made Instacart stand out for James? James’ experience: Juggling a full time professional job, active social life, and generally healthy lifestyle in today’s world is a nimble craft. I’m always looking for ways to manage the basics of life more quickly. I’ll happily pay a few dollars more for something if that means I’ll get back time in my day to do other things. Instacart assigns you a personal shopper who shops through your grocery list, lets you know of any necessary changes, and delivers your groceries to your door. With minimal effort on my end as their clear goal, they developed a way I can accomplish what generally takes as much as an hour and lets me do it in 5 minutes. They not only make the process easy, they anticipate my needs and questions. I’m not forced to buy brands I don’t want (and that may cost more), I can apply coupons and shop store specific brands. My favorite part is that I can preload a shopping list of “essentials” that I go through regularly and buy them all in one click. Sure, I might pay a little more to save time – but the real value is the thoughtfulness and attention to detail. I get my money’s worth. Lots of people like Chick-fil-A and it was Ryanne’s top pick. Chick-fil-A has set the bar high on customer experience in the fast food industry. If you’ve been to one of their locations, you too have likely had a positive experience. According to Ryanne, one thing she appreciates about their business model is that they work for the customer. Ryanne’s experience: I pulled up to the drive-thru window at one of the Chick-fil-A restaurants I visit often to pay for and receive the milkshake I had ordered. While handing me my usual milkshake, the team member at the window said, “You always ask for no cherries and this has a cherry on it; I need to make you a new one. Are you allergic?” I replied, “There is no need to make a whole new one. I am not allergic, I just don’t like the taste of cherries. Scoop out the cherry and I’ll be fine.” The employee honored my request not to throw away that milkshake but took it a step further. They scooped out all the whip cream (there were cherry drips all over it) and replaced it with a new dollop and a new plastic top. It felt great to realize this employee knew my preferences (yes, I guess it speaks to my love of milkshakes as well). Besides that, however, it was noticeable there was nothing mechanical about their actions. Recognizing a mistake had been made, they stopped, asked, listened, and corrected the mistake according to my suggestion. My experiences with other fast food restaurants when I have vocalized that I didn’t receive what I had ordered (that’s right, they had no idea) are typically that deer caught in headlights stare. And I like that they didn’t throw out the milkshake – it not only got me on my way quicker, it made me feel truly heard. This top pick will resonate with anyone who has ever wished that delicious meals could be put together quickly and easily. Blue Apron is Kate’s top pick because they make the experience of cooking easy and engaging. Kate’s experience: My fiancée, Cameron, grew up gardening. He knows how to propagate succulents and that crushing up a Coke can for the bottom of your potted plants helps prevent root rot. When we met, however, he knew absolutely nothing about cooking. I mean, he didn’t know you needed to boil the water before putting the pasta in it. His lack of knowledge made him feel foolish and made trying to cook way too intimidating. But that all changed with Blue Apron. I had been using Blue Apron because it took the planning and shopping steps out of the job of cooking dinner (something I enjoy). But one night when work had me slammed, Cameron realized that if he didn’t get resourceful he wouldn’t eat. So, for the first time that evening he turned to the directions that came with that box of perfectly portioned ingredients. Success. Instead of take-out, he made us pork chops with a balsamic pear compote. Now, just six months later, my novice ramen-eating fiancée has become a budding chef. Blue Apron anticipated the questions (even) a novice might have and designed their instructions for a positive experience. Brad gave kudos to REI for their value and expertise AND THEN explains why he won’t go there anymore. Known for quality outdoor products and knowledgeable, friendly staff, Brad offers them a piece of CX advice. Brad’s experience: REI’s knowledgeable staff can help you choose the right 60L Kelty pack with expandable 15L hood and air-flow vent system to wick and cool as you scale North Carolina’s very own Mt. Mitchell (the highest peak in mainland eastern North America). For me, this knowledge base and access to flagship brands has always made going to their store a unique customer experience. Where else can I tactilely daydream about kayaking the Amazon? I never begrudged their pricing; I felt they earned that market spot, and they do a fine job of maintaining it by offering a smattering of classes and seminars focused on spreading knowledge and serving as an origin point for outdoor collectives. It’s a fact: I love REI, I just can’t go there anymore. Maybe the premium pricing is creating trickle down pressure on the staff. Maybe they have a commission structure hidden in the background. But the last few times I’ve gone, “Can I help you with anything?” has turned into a broken record. I felt my movement was being tracked from section to section as if I was a wounded gazelle with a laceration in its wallet. The hyper acute sales team seemed to continuously re-fold perfectly folded socks just to get within ear shot. Even my kids picked up on it. “Why do they keep asking you that?” My response, “I don’t know.” What I know is that REI’s behavior is a testament to sensitivity and the importance of CX. I considered the first time it was a fluke, the second was noticeable, but when the same thing happened on my third trip to the store, I decided this must be their approach to CX. For all the awesomeness they offer, it’s my experience that dictates whether I partake. And I’ve decided I won’t. These are just a few of the great B2C customer experiences we could have shared (We didn’t even talk about Amazon!) So, what can professional service firms learn from these stories? How can your firm deliver the kind of experience that has your clients telling their peers? Know your clients! If your firm has a voice of client (VoC) process integrated with your service delivery, use it to enable your team to deliver experiences that show your clients you KNOW what they value. Encourage your team to take advantage of the information gathered, it’s available to your whole team. And, by sharing client insights during team meetings, everyone can easily understand client preferences and seamlessly serve your clients the way THEY like to be served. Designing and implementing a VoC process that gives your clients ongoing opportunities to share their preferences doesn’t have to be difficult. Learn more about Client Savvy’s Client Feedback Tool – read Getting Started with Electronic Feedback. Let’s get Savvy.